More than a month has passed since I’ve written here, but that doesn’t mean I’ve left it to sit. Okay, it appears as if it’s been abandoned. But I’ve been searching for and learning about many things that will hopefully make it function better than it has in the past. It seems everyone is reading favorite websites on their cell phones and tablets these days and so that makes it necessary to ensure all is functioning properly here. You may be one to roll eyes and question any sort of change, and I will smile in response, understanding. I will! But please know, my 75-year-old mother has to deal with me on a regular basis as I coach her on the most efficient use of her Mac, Kindle, and brand new iPhone probably more than she’d like, but she tolerates me. Sometimes. So thank you for your patience as I not only strive to make Sass & Veracity the very best it can be (at a glacial pace), and exercise my brain while I’m in the process. My work will never be done. Beyond tinkering with things here, I’ve been busy thinking about cooking and eating healthily (still — it’s completely endless) as well as planning for our late spring visit to Europe. We’re spending a week in Paris, then another near the Bavarian Alps in Germany and I have been busy putting all the details together. It’s like a huge puzzle and I get so caught up in it, I have to step back once in a while to tell myself it’s a vacation and not a project I’ll be quizzed on. That it’s just fine if some things are left to chance. And then I get nervous. Yes, I get that semi-queasy feeling in the pit of my stomach when I realize our trip is just a bit more than a month away. My husband is caught up in the throes of busy season right now, so I have to nudge him to say we’ll be on vacation soon, to hang in there and trust your in-house pseudo travel agent to plan a trip both restful and fun. This nudging worked early on, but by today, he is beyond reminders of time off and luxuriating in places far, far away. I’m sure that after April 15th, he’ll remember and hopefully counting the days. 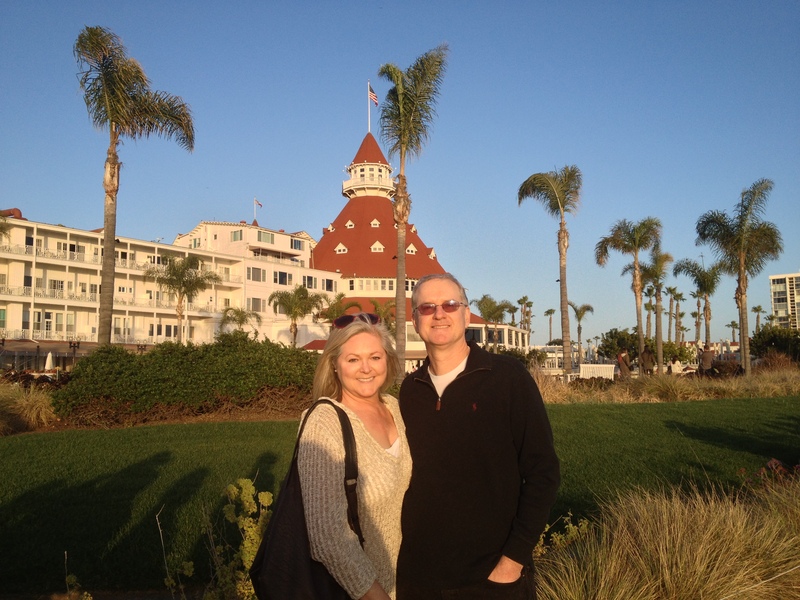 In the meantime, he did get a bit of a break not too long ago — a night spent at the Hotel del Coronado here in San Diego. At an annual local event we attend, we auctioned for a one-night stay in resort accommodations including dinner complete with wine and our bid won, so decided to use it as a mid-busy season stay-cation. As much as we make these decisions, we often forget then find the certificate long after we’d planned to use it. But this time, we remembered. He emailed me to tell me to book it, and so I did. And just a week or so later, we were there, relaxing and pretending like we were tourists in the city we’ve lived in for nearly all our lives — or in Coronado, which is its own city just across the bay from San Diego. Our stay was completely wonderful — and the best part was not having to deal with a long drive, or flight. While at the Hotel del Coronado, we had dinner at 1500 Ocean, its signature restaurant. We couldn’t wait to sample the menu and enjoyed every bit of what we ordered — pleasantly surprised that the chef, Robert Hohmann came out to speak to us near the end of our meal. He shook our hands and spoke to us about the delicious roasted artichokes and cauliflower veloute´ we’d enjoyed as part of our meal. I asked about both, of course, and he mentioned that when he prepared vegetables, he steamed them until nearly all the water had evaporated leaving intense vegetable flavor. For the artichoke, a final run under the broiler finished it off. 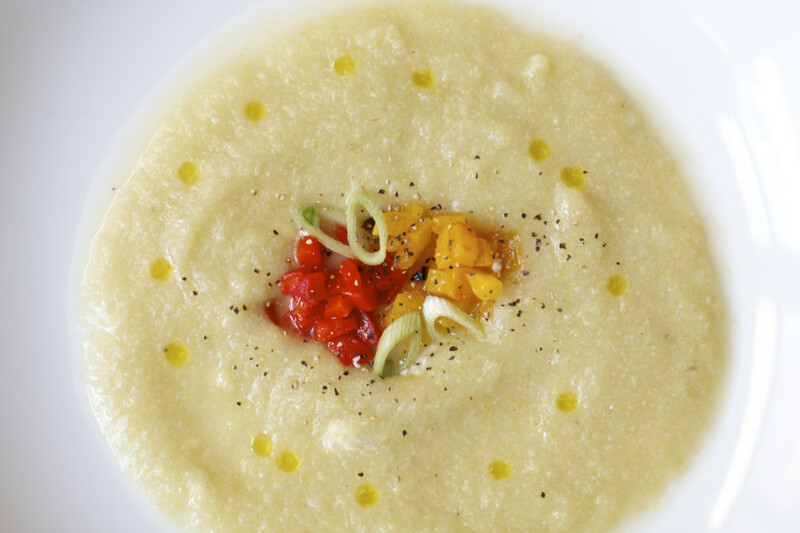 And no use of a chinois, or fine mesh strainer to achieve the velvety smooth texture of the cauliflower veloute´ — just the thorough use of a blender. I came home obsessed about this and as much as I’d made cauliflower soup recently, had to search for veloute´ to see what the difference was. I’d chosen a recipe fairly stripped down with the “broth” composed of whatever the cauliflower gave to it as it simmered. But honestly, I found myself sprinkling more and more salt into the soup to give it flavor it was so bland. And that’s not a good thing. I welcomed the chance to make it again and was more than pleased. The difference was primarily making sure the cauliflower was fully steamed so that when I put my immersion blender to work — and was patient — the cauliflower was reduced to a similar velvet texture we’d enjoyed at 1500 Ocean. Outside of enjoying our dinner, we also took advantage of our lovely room which had one of the few covered verandas facing the front of the hotel. I’d packed a bottle of bubbly so we could sit and enjoy the late afternoon comings and goings and San Diego’s beautiful nearly spring weather. The next morning, we ordered room service and had the table set outside so we could squeeze every minute of our short stay at the Hotel del Coronado. A stroll through the shops downstairs and a walk along the beach completed our morning. 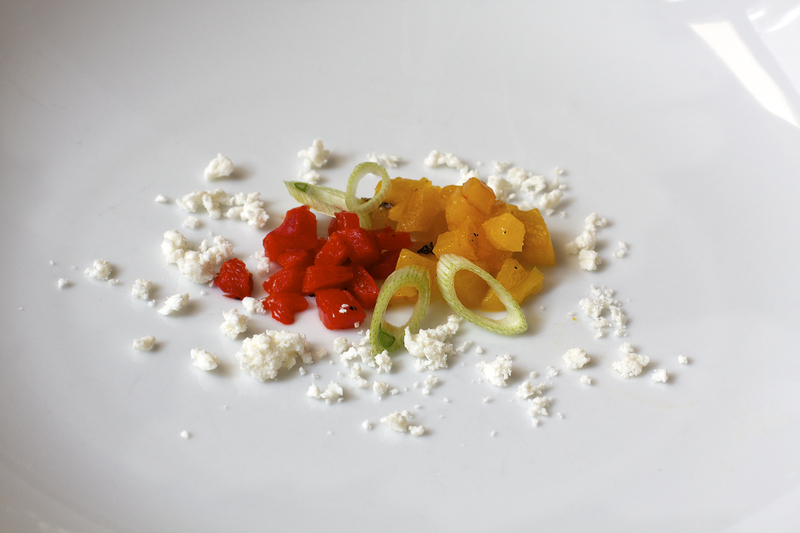 I’ll have to share more of our time there later, but in the meantime, here’s a lovely version of Cauliflower Soup with Roasted Peppers and Feta. 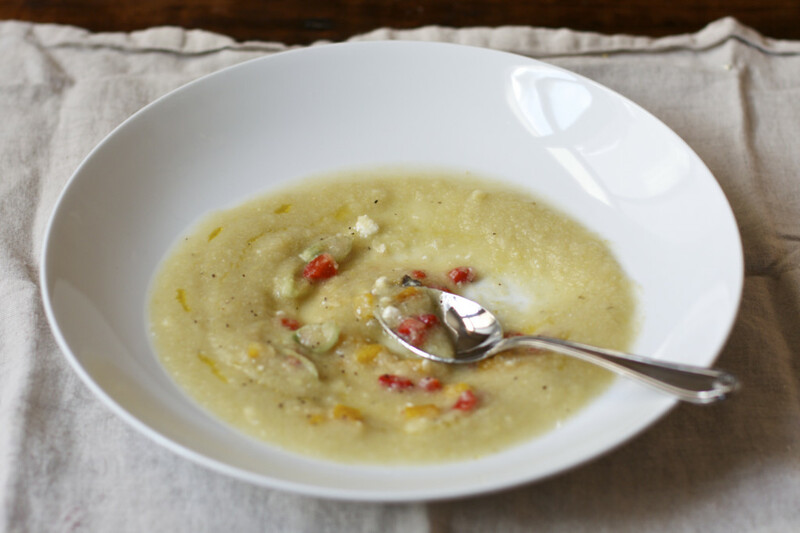 An easy to make blended cauliflower soup with garnish of roasted peppers and feta cheese. Roast the peppers first following the method in this recipe. Remove all the green leaves from the cauliflower and remove the stem by cutting down into the center of the cauliflower to carve a cone shape. Use your thumbs to reach into the cavity and pull the cauliflower apart to break into smaller florets. In a large pot, position a steamer over an inch of water. 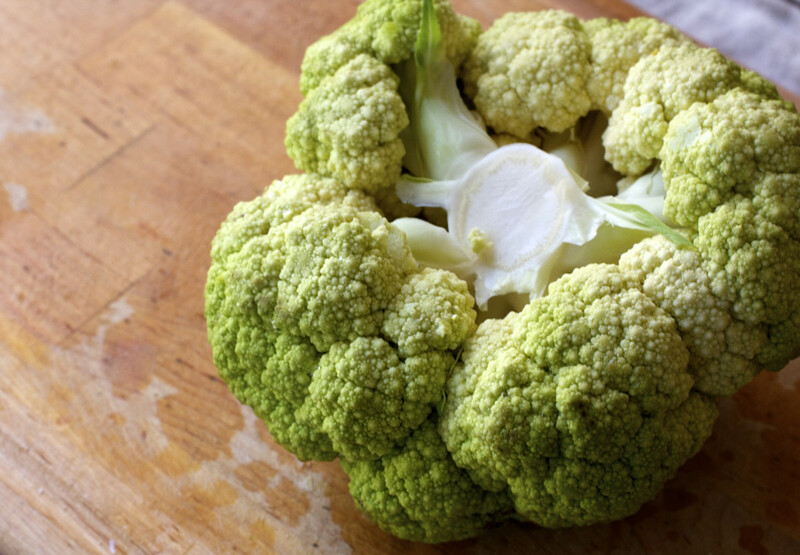 Place the cauliflower florets in the steamer and place a lid on the pot. Bring the water to a boil and steam the cauliflower until it is fork tender, about 5-6 minutes. Remove the cauliflower florets and set aside. Discard any remaining water. In the same large pot, over medium heat, melt the butter with the olive oil. Add the leek and shallot and saute 5 minutes. Sprinkle the flour over the vegetables, stirring well, and cook for 2 minutes until the mixture just begins to brown. Stir in the white wine and cook an additional 2 minutes. Add 1 cup of the vegetable broth slowly, stirring to blend as you pour. Bring to a simmer, lower the heat and cook for 10 minutes, stirring occasionally. Add the rest of the vegetable broth stirring to mix well, then add the steamed cauliflower florets and the dried tarragon. Bring to a simmer and cover the pot to cook for 15-20 minutes. Use an immersion blender to puree the ingredients in the pot, or alternatively, carefully pour into a blender in small batches to puree. To serve, place a tablespoon or two of the chopped roasted peppers and sprinkle with a bit of feta cheese and thin sliced green onions if you wish. Ladle the cauliflower soup into the bowl around. Finish by seasoning with some good sea salt and freshly cracked pepper and a drizzle of extra virgin olive oil. When I decided to make this soup, I began with one which was pretty basic as far as soup goes. The ingredients were cauliflower, an onion, water…sparse. As I mentioned above, as much as I am one who appreciates a simple vegetable flavor without the heavy other ingredients often found in “creamy” soup recipes, the recipe honestly tasted like nothing. I salted, peppered, salted some more not really understanding why it was so flavorless. 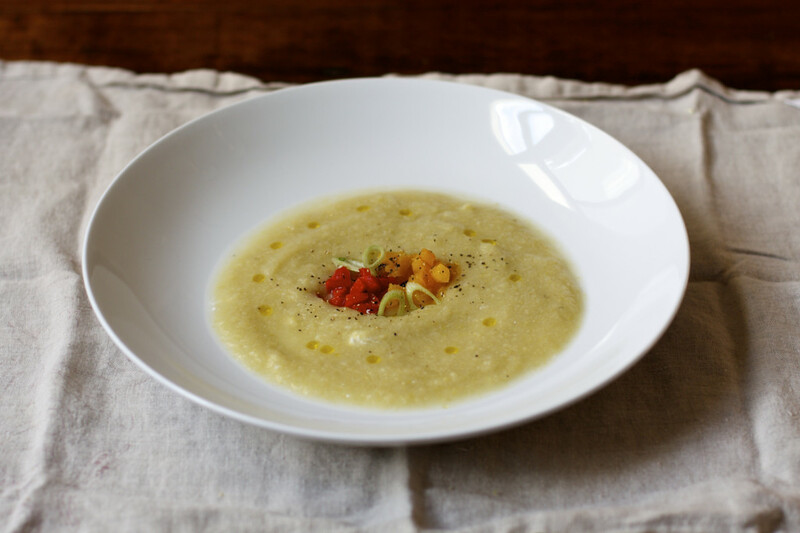 After eating the cauliflower veloute´ at 1500 Ocean, I had a better idea of what good flavor this soup could have and still wanting to avoid the fat, found a recipe I could adapt to my own tastes at Beyond the Ladle. 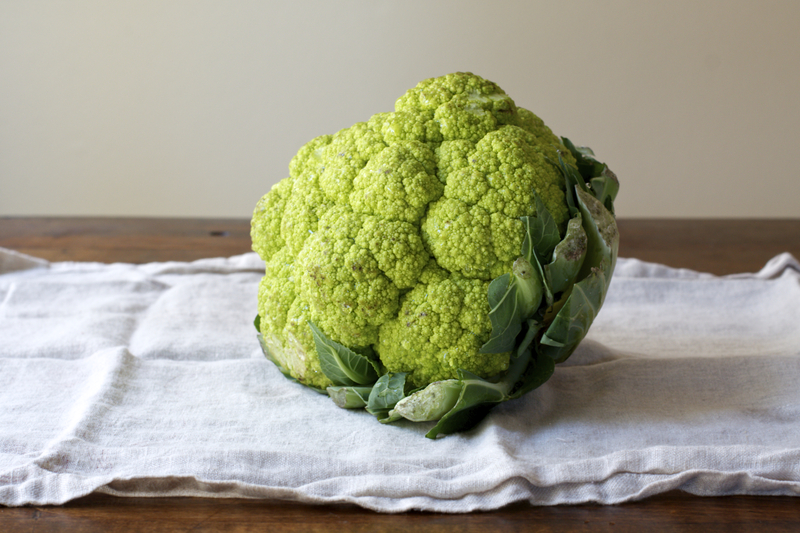 So why the green cauliflower? I see it, I buy it, then I decide what to do with it. I do know that color is almost never retained with exotic types of vegetables. So in the future, I will be more creative — or purchase white cauliflower which is much, much less expensive. I should point out there is no difference in the taste at all between the two. Essentially, what I have learned is that a veloute´ is a soup base or roux made with broth instead of milk (which makes a bechamel, or what my mother always called white sauce). It’s the thickener for the soup. 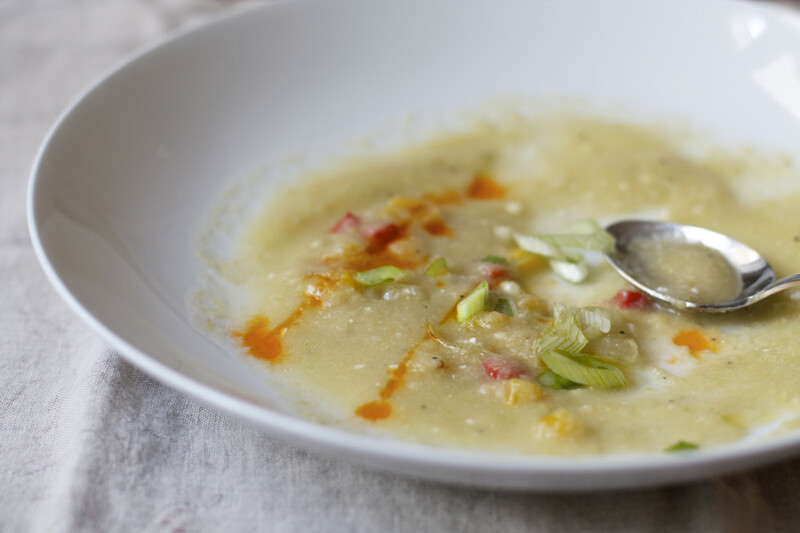 I’ve experimented with soup recipes that use a potato as a thickener instead of the flour and that works as well (see my “Creamy Asparagus Soup”). On the ingredients — I usually balk at anything with tarragon in it. I think it’s because it reminds me of licorice and I’m not a fan of licorice. But being the good sport that I am when it comes to food, I persist. And it paid off this time because the tarragon is LOVELY in this soup. A match made in heaven! As far as the shallot goes, I love their flavor, but you can substitute minced onion instead. Use what you have. 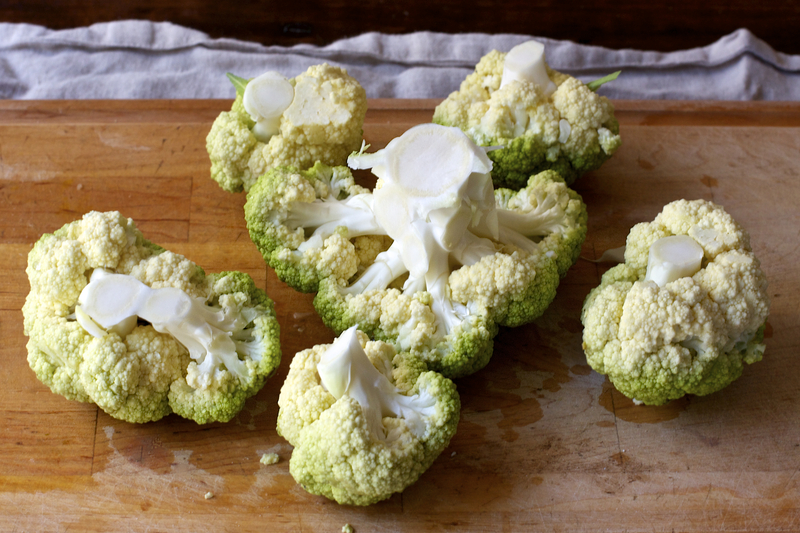 On the steaming — this was my attempt to keep as much of the nutrients in the cauliflower as possible and to play around with the idea the chef at 1500 Ocean provided me. If you’re not interested in doing this step, then just put the cauliflower into the broth after all of it has been added to the roux and cook it with a lid on the pot until the cauliflower florets are soft. And a final note: These photos were taken of the first recipe I tried — the stripped down version. Can you see how the texture is a bit grainy? The flavor was good once I’d doctored it, but I was searching for something to ramp it up and so in the final shot added chili oil. It was quite tasty! I did not take photos of the second and much better version of the soup which is the recipe I’ve posted here. It will be like velvet when it’s blended. It got an “Oh, wow, this is really good!” from the hubster as he slurped it from his spoon. And yes, he is right.